Stronghold 3 is a 2011 real-time strategy PC game developed by Firefly Studios and published by SouthPeak Games. The game is the seventh in the series of Stronghold games and it's surely a great game for Stronhold collectors and for those who like strategy and medieval games. It is the sequel to Stronghold, released in 2001, and Stronghold 2 released in 2005. 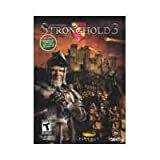 On this page you can find almost everything you need to know about Stronghold 3, check out some great features of the game, watch video previews and buy the game on Amazon for an affordabe price. There are also some very cool links below that will help you to bring your Stronghold experience to a whole new level by participating in Stronghold communities and learnings some new tricks. Become a great King, build your castle, rule your land! 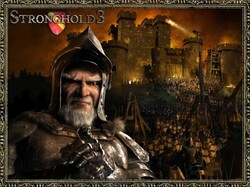 Train your army, run your economy and dominate the land in Stronghold 3! Stronhold 3 is a game where you are the king and you run everything from the economy, architecture, army and war. You control your town and you live good if your peasants and soldiers are satisfied with your town and with the way you're ruling the land. You need to be popular, you need to bring food to their tables and you need to keep them entartained. It's a great strategy game that's not all about war and fighting but also includes economy and carefull thinking if you want to succeed and have everything in order. You need to build a strong castle, an army that will defend this castle and you need to bring a nice life behind your walls so everyone will be satisfied and they will write poems about your kingdom years later. So what are you waiting for? Get your own copy of the game and start building your castle! Travel through time into the middle ages and become a great King that everyone will adore! Conquer lands, win in glorious battles and build magnificent towns and kingdom! Do you like Stronghold 3? Need to play it first! Read the official Wikipedia description of the game and find all the facts related to Stronghold 3. Also explore related games and previous releases of Stronghold. Stronghold heaven is an awesome community dedicated to this game. Here you can check out some awesome history facts related to this game, read a history of each castle featured in the game, download wallpapers and media and participate in forums. You can also submit screenshots of your castles and events in the game and see submitted pictures by others. Great community for every Stronghold players. This game needs more work. Next time they should work harder on it. don't buy it, it's worse then str 2, just got it for my birthday and it got less options then stronghold :$, im dissapointed..
Great review! I haven't yet played Stronghold 3 but strategies are my kind of games, so, now I have an idea what to get myself for Christmas.